Custom keyboard templates provide an economical and versatile way to customize your keyboard and improve productivity and efficiency. Common uses include specific software applications and work stations with multiple uses. 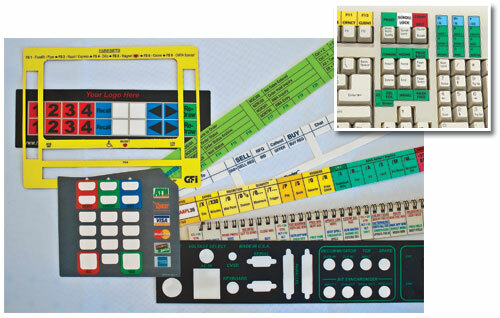 DataCal has been designing and manufacturing custom keyboard templates for over thirty years in Gilbert Arizona. Templates are created using durable polycarbonate and fit over your existing keyboard. This allows the user to change the template or work at multiple work stations with ease. Templates are commonly used for specialized software applications including financial institutions, for gaming purposes or anywhere versatility and efficiency are needed. At DataCal, we will design and manufacture exactly what you need quickly and affordably. Please call our custom department at 1-800-459-7931 for further information.